Research scientists in the Fluvial Landscape Lab have diverse interests and skills, organized around a common goal of making new discoveries about aquatic ecosystems by applying cutting-edge quantitative scientific techniques. Dr. Geoffrey Poole is the lab director. His research interests include understanding how the hydrology and geomorphology of rivers, wetlands, lakes, and floodplains influence the ecology of these freshwater systems. 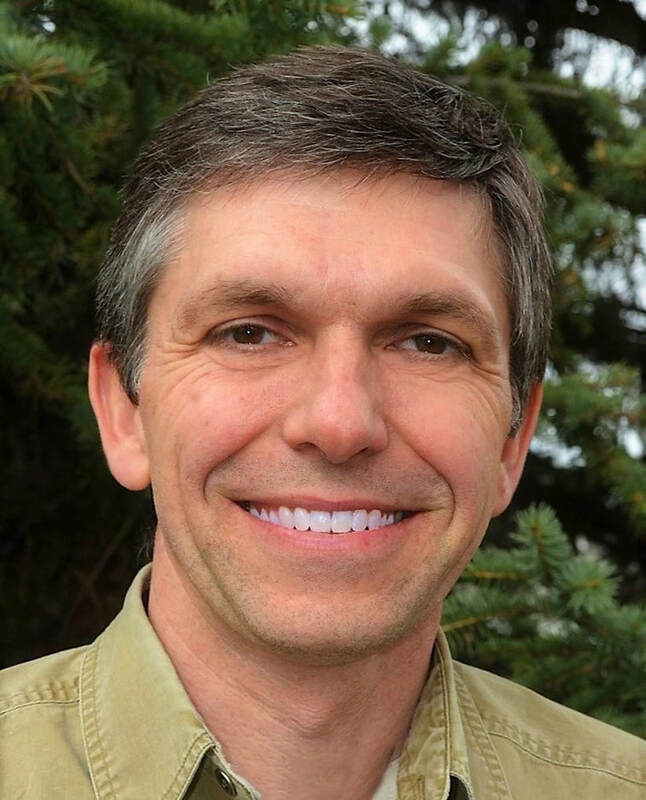 Geoff is an Associate Professor in the Department of Land Resources and Environmental Sciences at Montana State University and has been an researcher of aquatic systems for 25 years. Ann Marie is an Assistant Research Professor on the LRES faculty, working in collaboration with members of the Fluvial Landscape Lab. She started in the Fluvial Landscape Lab as postdoctoral research associate, after earning her Ph.D. studying the responses fish assemblages of the lower Yellowstone River to geomorphic alterations of the river including rip-rap, levees, and dikes. Ann Marie is now developing models of microbial community response to changes the availability of electron donors and acceptors. She is also a collaborator in stream temperature research with the Confederated Umatilla Tribes. Byron is a Ph.D. student conducting research on hyporheic response to stream restoration. His dissertation seeks to find novel ways to assess how reconfiguration of stream channels via restoration may influence stream temperatures by augmenting hyporheic exchange. Byron's work focuses on a 1.6 km channel realignment on Meacham Creek, a tributary to the Umatilla River in Oregon. Sam is earning his Ph.D. in the Fluvial Landscape Lab by developing a simulation model of stream respiration and nitrate uptake in stream networks. Based on the hypothesis that log-jams in headwater streams facilitate sediment storage, increased metabolism, and nutrient processing, Sam's simulation modeling research aims to demonstrate stream-network scale implications of reach-scale measurements being made in headwater streams of Colorado. Katie is a Ph.D. student in the Fluvial Landscape Lab, having completed her M.S. in the lab as well. She has develop a next-generation simulation model to represent the influence of hyporheic exchange on whole-channel water temperature. Katie's simulation approach implements a means of incorporating a residence time distribution within the transient storage zone of rivers. Her work aims to provide a new means of simulating hyporheic influences on river channels using 1D models of stream flow. Libby is earning a Ph.D. conducting research on the biogeochemistry of flow water systems. Specifically, she is working to build a foundations for a comprehensive theory describing the mechanistic controls on elemental spiraling in streams and along groundwater flow paths. Using a combination of modeling and empirical observation, Libby aims to explain how variation in different physical, chemical, and biological processes interact to influence "spiraling length" as elements are cycled during downstream transport. Matt Bain is an undergraduate researcher in the Fluvial Landscape Lab, working on advancing the capacity of constraint-based models of biogeochemistry using the GANGSTA modeling framework. Matt's work is helping to allow the optimization routines inherent in constraint-based modeling approaches to be responsive to dynamic environmental conditions, such as variation in temperature and pH. Alumni from the Fluvial Landscape Lab have conducted a wide array of scientific research, moving on to diverse water science careers, earning faculty positions, joining governmental agencies, and building consulting firms. P Della-Croce, GC Poole, RA Payn, RE Gresswell. 2017. Early detection of non-native alleles in fish populations: when sample size actually matters. Fisheries. 42(1), 44-56. RA Payn, AM Helton, GC Poole, C Izurieta, AJ Burgin, ES Bernhardt. 2014. A generalized optimization model of microbially driven aquatic biogeochemistry based on thermodynamic, kinetic, and stoichiometric ecological theory. Ecological Modelling 294, 1-18. AM Helton, GC Poole, RA Payn, C Izurieta, JA Stanford. 2014. Relative influences of the river channel, floodplain surface, and alluvial aquifer on simulated hydrologic residence time in a montane river floodplain. Geomorphology 205, 17-26. P Della Croce, GC Poole, RA Payn, C Izurieta. 2014. Simulating the effects of stream network topology on the spread of introgressive hybridization across fish populations. Ecological Modelling 279, 68-77. AM Helton, GC Poole, RA Payn, C Izurieta, JA Stanford. 2012. Scaling flow path processes to fluvial landscapes: An integrated field and model assessment of temperature and dissolved oxygen dynamics in a river‐floodplain‐aquifer system. Journal of Geophysical Research: Biogeosciences 117. C Izurieta, GC Poole, RA Payn, I Griffith, R Nix, AM Helton, ES Bernhardt, AJ Burgin. 2012. Development and application of a simulation environment (NEO) for integrating empirical and computational investigations of system-level complexity. 2012 International Conferenence on Information Science and Applications (ICISA). p 1-6. AM Helton, MS Wright, ES Bernhardt, GC Poole, RM Cory, JA Stanford. 2015. Dissolved organic carbon lability increases with water residence time in the alluvial aquifer of a river floodplain ecosystem. Journal of Geophysical Research: Biogeosciences 120 (4), 693-706. AM Helton, GC Poole, JL Meyer, WM Wollheim, BJ Peterson, PJ Mulholland, ES Bernhardt, JA Stanford, C Arango, LR Ashkenas, LW Cooper, WK Dodds, SV Gregory, RO Hall, SK Hamilton, SL Johnson, WH McDowell, JD Potter, JL Tank, SM Thomas, HM Valett, JR Webster, L Zeglin. 2010. Thinking outside the channel: modeling nitrogen cycling in networked river ecosystems. Frontiers in Ecology and the Environment 9 (4), 229-238. PJ Mulholland, AM Helton, GC Poole, RO Hall, SK Hamilton, BJ Peterson, JL Tank, LR Ashkenas, LW Cooper, CN Dahm, WK Dodds, SEG Findlay, SV Gregory, NB Grimm, SL Johnson, WH McDowell, JL Meyer, HM Valett, JR Webster, Clay P Arango, JJ Beaulieu, MJ Bernot, AJ Burgin, CL Crenshaw, LT Johnson, BR Niederlehner, JM O’brien, JD Potter, RW Sheibley, DJ Sobota, SM Thomas. 2008. Stream denitrification across biomes and its response to anthropogenic nitrate loading. Nature. 452 (7184), 202-205. GC Poole, SJ O'daniel, KL Jones, WW Woessner, ES Bernhardt, AM Helton, JA Stanford, BR Boer, TJ Beechie. 2008. Hydrologic spiralling: the role of multiple interactive flow paths in stream ecosystems. River Research and Applications 24 (7), 1018-1031. P Della Croce, GC Poole, G Luikart. 2016. Detecting and quantifying introgression in hybridized populations: simplifying assumptions yield overconfidence and uncertainty. Molecular ecology resources. 16(6), 1287-1302. AS Arrigoni, GC Poole, LAK Mertes, SJ O'Daniel, WW Woessner, and SA Thomas. 2008. Buffered, lagged, or cooled? Disentangling hyporheic influences on temperature cycles in stream channels. Water Resources Research. 44 (9). KL Jones, GC Poole, SJ O'Daniel, LAK Mertes, JA Stanford. 2008. Surface hydrology of low-relief landscapes: Assessing surface water flow impedance using LIDAR-derived digital elevation models. Remote Sensing of Environment 112 (11), 4148-4158. KL Jones, GC Poole, WW Woessner, MV Vitale, BR Boer, SJ O'Daniel, SA Thomas, and BA Geffen. 2008. Geomorphology, hydrology, and aquatic vegetation drive seasonal hyporheic flow patterns across a gravel‐dominated floodplain. Hydrological Processes 22 (13), 2105-2113. K Jones, G Poole, J Meyer, W Bumback, E Kramer. 2006. Quantifying expected ecological response to natural resource legislation: a case study of riparian buffers, aquatic habitat, and trout populations. Ecology and Society 11 (2). Jordanna Black graduated in 2011 and is now an Aquatic Restoration Specialist for the Washington State Department of Natural Resources. Jordanna earned her M.S. through the Fluvial Landscape Lab studying the interaction between aquatic habitat enhancement structures, fish holding patterns, and angler behavior. Her work documented that holding locations for fish that were associated with habitat enhancement structures were targeted more effectively by anglers, suggesting that fish holding in these locations are more susceptible to angling pressure. Jordanna was also instrumental in the design of ENSC448 Stream Restoration Ecology, a course taught annually by Dr. Poole.